Due to the Camp Fire, Butte County schools were closed November 9th-November 30th. 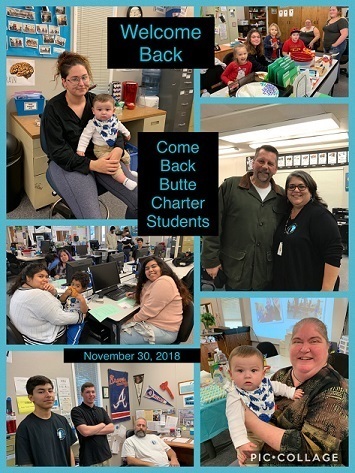 Come Back Butte Charter celebrated the return of students on November 30th, with a Pizza Party. Many students attended the party, where they had a pizza and salad lunch while visiting with each other and staff. The new mayor of Oroville, Chuck Reynolds, stopped by to welcome students back to school. He shared his education journey and the importance of a high school education. He commended Come Back students for choosing to return to school and wished them luck. Lots of hugs and smiles were shared. Come Back students do not give up and most will return to finish what they started!